Nightcrawler brushes with greatness before settling for a solid story with one truly great performance. When we first meet Lou Bloom at the top of Nightcrawler he is a lonely man desperate for work. Portrayed by Jake Gyllenhaal, Bloom is a quiet and reserved man who has spent far too much time on the Internet. He’s smart, but a lack of social skills prevents him from ever forging lasting connections with other people. To make ends meet, Bloom is a thief, taking everything that isn’t nailed down in order to keep a roof over his head. You feel sorry for him, but only from a distance. Lou’s life changes forever when he drives past a recent car accident while traveling through the city late one night. He arrives just before the press and as the scene plays out Lou cannot help becoming fascinated with everything happening in front of him. There is someone bloody and fighting to survive just feet in front of him, and standing over them are people with cameras doing everything in their power to get a great shot. It a short and odd portrait of life and media colliding, but it’s more than enough to sell Bloom on an intriguing new career opportunity. 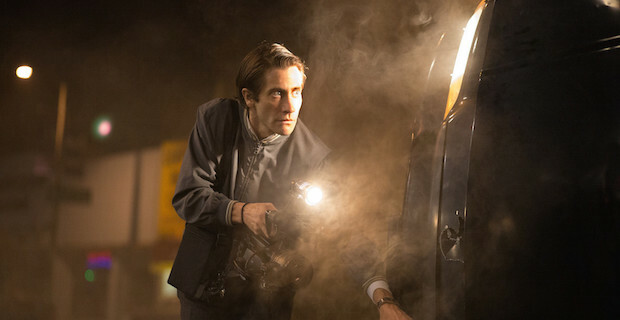 Nightcrawler is a film that intentionally sets out to make you uncomfortable. Bloom is clearly a little off, but we’re never given enough information about him to decide whether it’s the good or bad type of crazy (though the third act does offer some clarity). Aside from the mysterious motivations of our lead, there’s also the fact Bloom’s job requires him to film people at their absolute worst. He’s essentially a crime paparazzi, chasing the bloodiest and most violent incidents that come across his police scanner in hopes of landing a money making image. To do this, Bloom must get close to his subject. Too close, some may say. If you’re someone whose heart breaks whenever they see another human in pain you may feel helpless throughout the film’s 2-hour runtime. Writer/Director Dan Gilroy challenges us with these images, as well as the way Bloom makes his money, in hopes of causing us to reflect on our own addiction to media. The old “if it bleeds, it leads” adage is put to the test in an unflinching way. It asks just how much is too much when covering the worst moments of the human experience. You feel disgusted with what Bloom is willing to do for a good pay day, but at the same time you cannot resist the urge to gawk at everything unfolding on screen. Can we really hate or shame someone for doing something that we, as media consumers, demand? Also, can anyone draw a line between what is in good taste and what falls outside the realm of things that should be shown on TV? If so, how? All of this and more comes into focus throughout the story, and it lingers in the mind long after the credits have rolled. I think it would be possible for Nightcrawler to succeed with a number of actors in the lead role, but something about the way Gyllenhaal brings Bloom to life makes the character feel like a creation wholly his own. Lou is presented like someone who attended a motivational seminar taught by Wolf Of Wall Street inspiration Jordan Belfort and immediately set to putting his advice into action. Lacking Belfort’s people skills however, Bloom’s efforts to be friendly and/or helpful come across as creepy and somewhat unsettling, even when Bloom only has the best of intentions. This is due in part to the lack of information we have about Bloom’s history, but also because of how Gyllenhaal carries himself when in frame. He rarely looks confident, but is clearly always trying to think of his next scheme for success. He’s smart, but not in a way that necessarily comes across in conversation, which causes a lot of people to underestimate just how far he’s willing to go in order to achieve his goals. In short – he’s unpredictable, and it’s because of Gyllenhaal’s abilities to keep that sense of mystery alive throughout the film that makes the story work so well. The biggest problem facing Nightcrawler is not as much an issue as it is a disappointment. Gilroy sets up a beautifully haunting, visceral universe for us to explore and populates it with truly unique characters, but their conversations and actions never go as far as you feel they could. Though the story deals with topics like how far the media will go for a story, much of what happens during the film’s runtime is relatively tame. There is some blood, as well as a handful questionable decisions, but it’s hard to not feel like the story is falling short of its full potential. Bloom could be crazier, his actions could become more extreme, and the way he interacts with the more level headed members of society never really comes to a head of any kind. That’s not to say the story isn’t thrilling, but it’s nowhere near as crazy or dramatic as the marketing would lead you to believe. Though it falls short of its potential cinematic glory, Nightcrawler is a visceral and exciting look at life in the underbelly of modern media. Dan Gilroy has crafted a story that, aided by the incredibly believable delivery of Jake Gyllenhaal, grabs you by the throat early on and refuses to loosen its grip until the final scene comes to a close. You won’t be able to look away from a single frame, though every ounce of your being may beg you to at least consider taking a break, and when it’s all over you will be left with questions regarding our culture and society that linger for days on end. I cannot tell you whether it’s right or wrong to enjoy this picture, but you certainly won’t forget what you have seen.